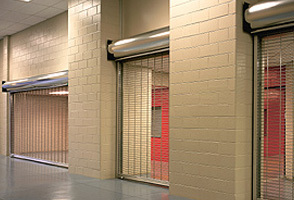 Overhead Door Corporation´s upward-coiling grilles (670 Series) provide an attractive yet functional means to secure areas where public access must be restricted. These ruggedly-constructed grilles provide security without sacrificing visual access, air circulation or light infiltration. Available in aluminum, galvanized steel, or stainless steel curtain — and with an optional electric operator — our rolling grilles are well-suited to most any environment and application. Aluminum, galvanized steel or stainless steel curtain meet a wide range of project and design requirements. Aluminum curtain with optional fire-retardant polycarbonate panel provides full visual access, and adds protection against theft. Choice of straight-lattice or staggered brick pattern for added interest. Optional electric operator allows grille automation for 24-hour parking garages and institutional/industrial applications. Special high-usage package promotes long-life and low-maintenance in heavy-use applications.